Did not some of the Fathers of the Church regard this fire as only figurative? Yes. only a few, among them Origen and St Ambrose, but tradition is overwhelmingly against them. The New Testament describes the punishment of hell as fire no less than thirty times. St Peter and St Jude compare it with the fire of Sodom, which was very real. No Catholic could deny that the fire of hell is real without sinning seriously against faith; it would not however be formal heresy because it is not a defined dogma. What is the main difference between the pain of loss and the pain of sense? The former is the absence of something, the latter the presence of something. You say the fire in hell is real, created and physical. Please explain this further. Christ, God Himself, used the word 'fire' to describe the torment of hell. Fire, then, must be that element best known to us which produces results most like the fire of hell. There are obvious differences. The fire we know depends on combustion; the fire of hell does not depend on being constantly fed with fuel. It depends solely on God's will. God showed Moses a bush which, although it was in flames, was not consumed. Hell fire does not give light, for hell is described as darkness. It is capable of afflicting spirits, wherever they are and tormenting the damned unequally according to their sins. Is it possible to explain fully the nature of hell fire? No, because we have to use the ideas and words with which we are familiar here to describe a world of which we have no experience. Christ used the word 'fire': therefore we know it is the nearest analogy. Sentimentality has pushed modern discussion of hell fire to such lengths of aversion as to make it almost non-existent. But so ancient and so universal is the teaching of the theologians that it would be extremely temerarious to deny its reality. There is real fire in hell by which the devils and souls of the damned are punished until men's bodies finally rise. 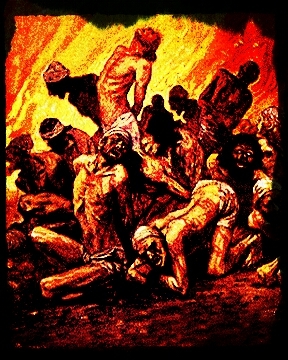 Then the bodies of the damned also suffer punishment by fire. This fire works supernaturally. As an instrument of God's justice its effects are entirely beyond the natural powers of fire. We must not think of burning devils or separated souls. We just do not know how fire punishes them. St Thomas Aquinas conjectured that the action of hell fire was mainly one of hemming in and limiting the activities of the proudest creatures of the universe. Is not the word "fire" just a metaphor for the pain of loss? No; it is a pain inflicted by an external agent by God's will. Did God create this fire specially for hell? We do not know. It is not necessary that He should have done so. If God exists He is love; hell spells hatred: are not these two contradictory? Yes, God is love. He loves all men. In His love He gave us freedom to reject Him. If we do that what can we expect but the opposite of love? God damns only those who deliberately choose hatred and evil instead of love and goodness. Yet this loving God could prevent our choosing hatred and evil; if He is all-powerful as well as all-loving should He not do that? Yes, God is all-powerful; He is all-wise, too. He chose to make us free. He could have done otherwise. Our freedom does not limit Him in any way. God is not beaten by the man who rejects Him. It is not for the creature to say that the Creator should have done this or should have done that. How can an infinitely good God insist on keeping His creatures imprisoned in an abyss of fire forever? Is He never satisfied? Would it not be better to annihilate them? It would not. If you demand the annihilation of sinners you demand that God reverse His plans; you want Him to stultify His own work and admit that He is powerless. God is merciful; why does He not forgive the devils and the damned? Because they do not want mercy; they want hell because they have decided they do not want God. There is no alternative. When God offered them mercy they rejected it and chose evil instead. Surely after the experience of hell sinners would repent and want God? They would not; they have chosen evil deliberately. What you suggest is hardly true repentance, which is a loving choice of God, not something which is forced on one by the experience of pain. Does not the Bible say (Heb. 2:14) that the devil will be destroyed? The Bible says no such thing. Your text teaches that the Redeemer will destroy Satan's power over the redeemed, not Satan himself. Is not all this talk about hell quite unreasonable? It is not. Reasonable men accept what God tells them. There are few things He has told them as clearly as the existence and eternity of hell. How could a parent be happy knowing his child is in hell? Love that is natural during life becomes supernatural after death. Supernatural love of God is incompatible with love of evil. The child in hell has freely chosen evil. The parent sees him now in the light of the justice of God. What about all the good that the damned must have done in their lives along with the evil? They themselves deliberately cancelled it out; they turned against it. That is what mortal sin is—the free, deliberate choice of grave evil in preference to God. If God's love for men is so great that He died for them, surely it is great enough to forgive always? Precisely; God's love has no limits. It is Himself. But He cannot forgive those who will not be forgiven. A grave sinner is one who rejects God's forgiveness. His love of goodness is without limit; His hatred of evil is therefore in due proportion. Sin is evil; God only sends men to hell when they choose to go there by freely rejecting His love. Is it just that a momentary sin should be punished timelessly? Quite just; the time it takes to do grave wrong is beside the point. What matters is the wrong done, that it is gravely evil and done freely. Surely there comes a time when enough satisfaction has been paid? No; not if the sin is mortal. It is a complete rejection of infinite good. If a sinner knew that after a time God was bound to remove him from torment he would be in a position to threaten God, saying, as it were, "God, do your worst; I may go to hell for a million years but you are bound to have me in the end for a timeless eternity." To think of hell in relation to time is quite wrong. There is no time in hell. Surely infinite mercy cannot allow such an unmerciful thing as hell? On the contrary, hell is most merciful. Even though it exists God need not have revealed it to us. Knowledge of hell has prevented very many sins and their dreadful consequences for individuals and human society. How can Christ be so cruel as to damn souls for ever? He was always so gentle to sinners, Precisely; He was gentle to repentant sinners. He still is. Yet this same gentle Christ said such very strong things about hell. We should take all the more notice of them therefore. Justice and reasonable punishment are not cruelty. Hell is just and reasonable. God has made serious laws for our well-being; He has told us the penalty for breaking them. He helps us by His grace at every moment to keep them. Who is to blame if we disobey? What percentage of men goes to hell? We do not know; God has never told us. Is Judas in hell? It seems that he is because Christ said of him: "Better for him that he had never been born"; but we do not know for certain. Is Adam in hell? It seems not; almost certainly he is in heaven. Scripture says: "God brought him out of his sin" (Wis. 10:2). The Greek Church keeps Adam's feast. God is everywhere; if hell exists God must be in hell: but that is impossible. So tell me do you still believe in hell? I do; God is present in hell as He is present everywhere else by His being, His knowledge and His power.